In 1434 we have the Ferrarese note, that a card deck was imported from Florence. Around this time the intellectual exchange between Florence and Ferrara increased. In the stream of this exchange Leon Baptista Alberti (1404 - 1472) became associated to the Ferrarese court. Alberti was mainly an architect, but contributed to various other fields of culture, too. His most famous work became the Tempio Malatestiana, done for Sigismondo Malatesta. later the compromise of the competitors, where one constructed the horse and the other, the rider, attributed in some part to Alberti's influence. The Latin inscription which notes Niccolo's skills as a diplomat implied his 'three times creator of peace in Italy" stresses the direct line by which power had been transmitted from Alberto d'Este to Niccolo and from Niccolo to Leonello.(4). 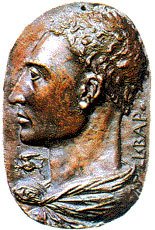 Alberti's other influence seems to be in bronze medals. In 1438 Pisanello produced a bronze which had Byzantine emporer John VIII Palaeologus, as the emperor came to Ferarra for the council. On the back side is an equastrian portrait of the emperor, dressed for hunting, praying to a wayside cross. From the 14th century on, scholars interested in Roman history collected Roman coins. Leonello eagerly collected ancient gems and coins and seemed to have been the first Italian prince to do so. Pisanello seemed to have seen the medal as a modern counterpoint to the ancient coin. Anthony Grafton suggests that Alberti's treatise "On Painting" showed influence on Pisanello's bold execution of his own signature on the medals. Alberti himself had a plaquette struck that emphasized his own resemblence to the Marquis' leonine curly hair. In 1443 Pisanello made eight bronze medals for Leonello. Alberti was in Ferarra consulting on the statue of Niccolo the III. The fashion for medals spread widely through the Italian courts, from the Malatesta of Rimini to Gonzaga of Mantua and beyond. The 1443 treatise on the horse (to Leonello) was brief, for his patron was already an expert. (6) Descriptions of ideals to the mundane and a survey of information from manuscripts available from the local libraries of Ferarra reflected the interest of this regional court. The Este, who ruled Ferarra, rode horses into battle and to the hunt. They bred horses for speed, entering them in the palio at Siena and elsewhere, and they had their horses portraits painted by their favorite artists ... as nobleman and warriors, they had to be skilled horsemen. Riding with pleasure and paches helped them to play the role of rulesers fittingling at home, and in some cases, to make their way in foreign courts. Francesco d'Este, (illegitimate son; note autorbis) of Leonello, needed to be a good horseman in order to serve in the brillant norther courts of Charles of Charolais and Charles the Bold, where he took an active part in wars and tournaments. (2) M. Baxandall A Dialogue on Art from the Court of Leonello d'Este, Journal of the Warburg and Courtauld Institutes 26 (1963), 304-26 at 314, 318, 316. (3) Anthony Grafton comments on Decembrio's text: "Deembrio's portrait of Leonello, though not fully accurate, corresponded to historical reality when it respesented the prince as having learned from Alberti but also having developed tastes and interests of his own."A. Decembrio, De politia literataria, 2.21, Bilioteca Apostolica Vaticana MS> Vat. lat. 1794, fol. 47, recto. (4) C. Rosenberg, The Este Monuments and Urban Developments in Renaissance Ferarra, Cambridge, 1997, 53-54.(11).S.K. Scher, ed., The Currency of Fame: Portrait Medals of the Renaissance, New York 1994, pl. 4. rev. (5) LB Alberti, Ludi rerum mathemticarum, in Opere volgari, ed., Grayson, III, 133, 173, 151, 161. (6). L.B, Alberti, De equo animante, ed. C. Grayson, JY Boiarud and F.Furlan, Albertiana 2 (1999), 191-235 at 204-207, 232-33. (This edition supercedes the older one by A. Videtta (Naples, 1991). On the sources that Alberti used, see S. Salomone, "Fonti greche nel De equo animante di Leon Battista Albert", Rinascimento, 2d set, 26 (1986), 241-50, arguing that he drew on Zenophon's Peri hippikes, then untranslated; cf. 197. 1404: born in Genua as illegitimate son of a banker as Battista Alberti (the name "Leon" was later adapted), the family was exiled from Florence in late 14th century. 1415 - 1418: studies in Padua under the humanist Gasparino Barzizza, learns Greek and Latin. It's speculated, that already in these years a friendship to the mathematican Toscanelli was established. 1421: Alberti's father dies. As a result the living conditions for the 17 years old natural son Leon Battista began to worsen. Generally Aberti is described with excellent health and athletic stature, for this time "loss of memory and a morbid visual sensitivity" (quote) are mentioned. His studies of law are interrupted and he focussed on physics and mathematics including optics. 1424: At the university he writes his first Latin work Philodoxeos fabula, a comedy, in 1424. According Alberti's own later statements in a letter to Leonello d'Este (1436), Alberti first disguised his personal authorship and declared the work as a classical text, which he found in an old manuscript. The text might be of some importance for Tarot history, as Alberti uses in the small piecepiece allegorical figures, which later reappear in the iconography of the Tarot sequence. till 1428: The studies of canon law in Bologna are finished, in spite of the earlier interruption of the studies. 1428, October: Pope Martin V. stops the exile from the Alberti family from Florence. Battista orients himself to an ecclesiatical career. 1428/1429: His tratise "De commodis litterarum atque incommodis (On the Utility and Disadvantages of the Study of Letters) is finished. First works in Italian language, between them two dialogues Deiphira and Ecatonfilea (love themes). 1431: It's speculated, that Alberti accompanied cardinal Albergati on a journey to Northern Europe (in his function as a leader at council of Basel). It's assumed, that Albergati was during the journey painted by Peter van Eyck in Bruges. 1432, October: Leon Battista enters the papal curia in Rome as secretary of Biagio Molin (patriarch of Grado). 1432 - 1434: composes 3 books of Della famiglia (About the Family). Interests in optics and architecture. 1433: A commission of Biagio Molin leads to Vita S. Potiti (Life of St. Potitius), story of a boy martyr. 1434: Pope Eugen is driven out of Rome and Leon Battista accompanies the curia to Florence. In Florence he gets acquaintance to Donatello, Brunelleschi and Ghiberti. 1435: Probably induced by friends of the artistic milieu Leon Battista writes in Latin language the important "De Pictura", his most reknown work. The work is dedicated to the current signore of Mantua, Gian Francesco. 1436: "De Pictura" is translated to Italian language by himself. The translation is dedicated to Brunelleschi. Apologi in the manner of the fables of Aesop. The latter seems to prepare "Momus". Sofrona and Uxoria, two works on love and marriage. 1438: Attends the Council of Ferrara. According a short biography or autobiography written c. 1438 in Latin and in the third person Alberti was capable of "standing with his feet together, and springing over a man's head." and he "excelled in all bodily exercises; could, with feet tied, leap over a standing man; could in the great cathedral, throw a coin far up to ring against the vault; amused himself by taming wild horses and climbing mountains." Abilities as musician and organist are noted also, but they are not confirmed by other sources. 1439: Attends the Council of Florence. 1441, 22th of October, in time parallel to the marriage of Bianca Maria Visconti and Francesco Sforza: Leon Battista organizes with the help of Piero de Medici a famous poetical competition, "Certame coronario". Participants had to write a vernacular poem about friendship (the contest might have relations to the coronation of Petrarca as poetus laureatus in 1341 in Rome, perhaps the idea was to revive the earlier active poetus laureatus tradition). In the same year (? 1443 ? ): Equo animante, a treatise on horse-training, which he dedicated to Leonello d'Este (? 1442 ?). 1441 - 1443: In his "last years in Florence", he writes two pieces, which are inspired by the Roman satirist Lucian. Musca, a praise on the fly (adapted after Lucian's work with the same name) and Canis, an ironic piece on his own dog. 1443: Alberti returns to Rome - according the greater distance to Ferrara one might assume, that the earlier contact might have stopped now. The important work of Momus is said to have been started this year (finished ca. 1450). Again it's made with Lucianic influences and it presents a deep satirical side of Alberti, by some even interpreted as "savage and pessimistic", a mockery on the new interest in the antique world of Gods. In the text the "universal beggar" is shown as an ideal, the only free man, by Momus. It's possible, that Alberti influenced the figure of the beggar in the later Mantegna Tarocchi with it. Another aspect is a far developed scene with an olympic theatre in the text, filled with sarcasm and mockery and funny episodes. 1447: Alberti's friend Tommaso Parentucelli of Sarzana (reknown for his book collecting activities) becomes Pope Nicholas V. Alberti is in these years inspired by the topography and the monuments of Rome, which leads to his Descriptio Urbae Romae. Perhaps the script contained drawings of city scenes, but it is lost. Also lost is a manuscript of this time "Navis (Ship)", which is mentioned in a later work. 1448-1449: De Porcaria coniuratione (About the Conspiracy of Porcarius), a historical work (the story is also a topic to Macchiavelli. Ca. 1450: Alberti finished Momus. 1450: Leonello d'Este died (this raises our question, if "finishing Momus" and the death of Leonello have a logical context). Two years later (1452) Meliaduse d'Este, brother of Leonello, died also, who had been called very close to Alberti. It seems, that the closer connections between Alberti and Ferrara have ended in this time. 1450 - 1452: a mathematical handbook, Ludi rerum mathematicarum (mathematical games). 1452: De re aedificatoria (On Building), divided in 10 chapters as De architectura from Vitruvius. A great variety of practical and theoretical archtectural topics. 1455: Pope Nicholas dies. A lot of architecturial dreams stay unrealised. 1457-58: Engagement in his only private building, Palazzo Rucellai in Florence. 1460: Short rhetorical handbook, dedicated to Lorenzo de Medici (the younger, then 11 years old), Trivia senatoria (Senatorial exercises). In the sixties: Two churches in Mantua, San Sebastiano and a "grandiose basilica" San Andrea. 1467: "De componendis cifris", a work on cryptography. 1467: The work "Hypnerotomachia Poliphili", published 1499 likely by Francescus Colonna, is suspected to be a work of Alberti. The unknown author finished his work in 1467, one year before the scandals around the Accademia Romana. 1468: His last work De iciarchia, a moral dialogue in Italian, in which the role of the prince is discussed and the iciarco ("the first citizen"). 1472: Alberti died in Rome.